Nowadays businesses become more and more connected. And information is accessible from across the globe making business managing easier than ever. But this also brings new concerns when it comes to security. And today information is everything. When a certain workstation has access to your full store data, this means that an outside person can use social engineering tricks to access your information or steal the whole workstation and use the information in it. Security is a top priority in the creation of IncoCloud. Here is how IncoCloud can help you protect your data? 1. If your workstation has been stolen the first thing you can do is login in your IncoCloud account from here. Select the name of your IncoCloud group. 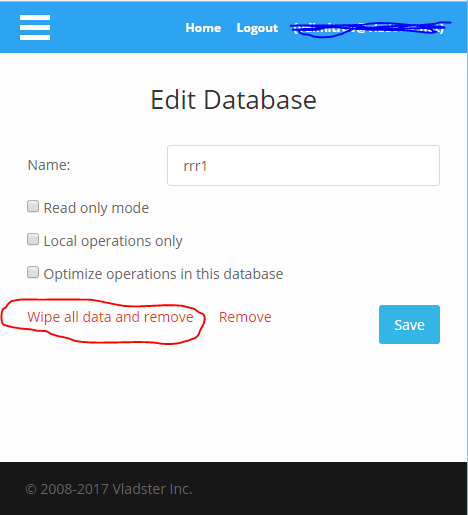 In the Databases section, select the name of the stolen database and press Wipe all data and remove. This will erase all your information from the stolen database when IncoPOS or IncoCloud attempts to connect to IncoCloud. All your information in the other databases will remain intact and your cloud backup will continue to work. 2. You can limit the operations stored on the machine only to the local operations. This means that you will have all the stored data available and the availability in the other locations, but no operations from the other locations. Login in your IncoCloud account from here and select the name of your IncoCloud group. In the Databases section, select the name of the database and enable the Local operations only option and press Save. Before that make sure that in the Locations section the management of the locations is properly set to the databases that are ones to these locations. 3. IncoCloud has a service called Database optimizer. It lets you speedup your database by deleting old information from the machine. This way the database does not need to work with millions of records that may never be needed on this machine. This service can also help you minimize the risk from stolen data as you will not be leaving all the store history to unwanted audience in case they get to it. To enable this service login in your IncoCloud account from here and select the name of your IncoCloud group. In the Services section in your account enable the service. Click on the name of the service to see instructions on how to configure each database individually. Each database can store a specified period of days, weeks or months of history and all older information will be deleted each morning automatically or when you change the configuration for the service.